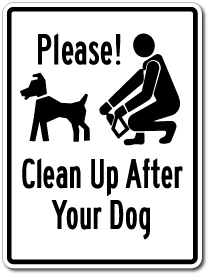 Insuring extended sign life, "Please Clean Up After Your Dog" sign is made from .040 12" x 9" Aluminum Sign with Standard 1/4" Mounting Holes Centered Top and Bottom. These signs are available in your choice of RED, BLUE, BLACK or GREEN on white background. Each has a reflective sign face option achieved by applying 3M HIP reflective material.